Members of Reversing Falls Sanctuary are leading a volunteer effort to produce low-cost window inserts to guard against heat loss. The project is an extension of WindowDressers, a Rockland-based nonprofit. With Old Man Winter looking to return, local residents will soon be scurrying to secure their homes against heat loss. Many homes, both old and new, lose untold amounts of heat through windows, which can often be challenging to maintain and expensive to replace. But members of Brooksville’s Reversing Falls Sanctuary are joining up with a statewide initiative that helps people combat heat loss while reducing carbon emission and fuel costs. 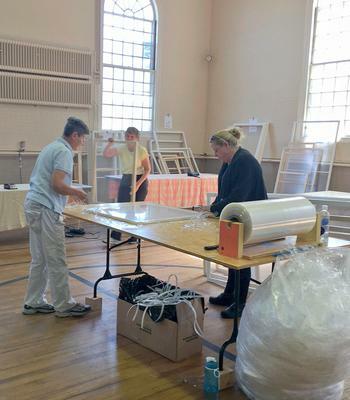 The Rockland-based nonprofit organization called WindowDressers has crafted thousands of low-cost window inserts since it began in 2010, and participants hope to make a few thousand more this fall in a dozen or so volunteer production efforts around the state, called Community Builds, local project coordinator Tony Ferrara said on August 28. The inserts are an inexpensive alternative to replacing windows, Ferrara said, and can save residents around 10 to 20 percent on fuel consumption, giving a return on their investment within the first heating season. They consist of pine frames with both sides wrapped in clear polyolefin plastic, and an insulating air space between the two layers and a foam weather strip edging reduce heat loss and stop air flow. They are installed against windows from a home’s interior and can be re-used for years if cared for properly, Ferrara said. The inserts cost about $2 per square foot, with the average window being around $20, and the WindowDresser program also subsidizes inserts for families who cannot afford to pay full price, Ferrara said. Hundreds of inserts will be fabricated at the Blue Hill Peninsula Community Build, and the measurements are already in for this year. Volunteers visited area homes and took window measurements with a laser tape measure, and that information was sent to the main production site in Rockland, where the lengths of pine are cut to fit. Volunteers do the final assembly locally, however, and this keeps costs low, Ferrara said. The project is a good fit for Reversing Falls Sanctuary in that it builds community and encourages ecological awareness, volunteer Anne Ferrara said. It encourages community self-reliance and allows for outreach across communities, Tony Ferrara added. Reversing Falls Sanctuary and the WindowDressers project also received a Pulliam Grant from the Castine Unitarian Universalist Church to cover local expenses and operational costs, Ferrara said on September 22. Ferrara will give a presentation on the project on October 8, at 7 p.m., at the sanctuary as part of Reversing Falls Sanctuary’s Green Energy Series, which features speakers the second Thursday of every month. Volunteer coordinator Tom Adamo said help is needed for the week of October 25 through 31. The Community Build will take place at The Brooksville Community Center, with the main assembly running October 26 through 30, in two shifts: 8:30 a.m. to 12:30 p.m. and 1 to 5 p.m.
To volunteer for the project, visit reversingfalls.org and click the VolunteerSpot tab on the home page. To volunteer for Saturday, October 31, email radius@myfairpoint.net. Call 326-8564 or visit the website for more information.